Singapore Airlines charged this man with a humongous amount of money for accessing the Wi-Fi on board. 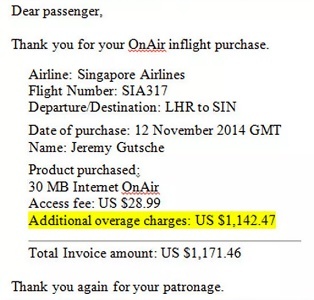 Well, the amount is as much as $1171.46 for a single flight journey and this is a serious matter to worry as you can commit mistakes like turning on the Wi-Fi for a minute work and then forget completely. You little kid can turn it on with careless taps of fingers. This man named Jeremy Gutsche had this awful experience when he was handed over this terrific Wi-Fi bill. Have a look at what he wrote about this incident. You know that epic feeling when your flight ends and you finally get to your destination? Now imagine taking those first steps off the plane, syncing your phone, and getting a $1200 bill for airplane internet use. That’s what happened to me on Singapore Airlines today. So what does it take to rack up $1200 of internet use? In my case, just 155 page views, mostly to my email. I know this because for the first time I counted up my page views to see where all the dollars went. I wish I could blame an addiction to NetFlix or some intellectual documentary that made me $1200 smarter. However, the Singapore Airlines internet was painfully slow, so videos would be impossible and that means I didn’t get any smarter… except about how to charge a lot of money for stuff. I did learn that. At one point, I spent about an hour uploading one 4mb powerpoint doc. That doc probably cost me $100 to upload, so I hope my team liked it. I actually even emailed them a warning that my upload was taking a while. That email probably cost me $10. And yes, the pricing per mb was disclosed on sign-up, but I bought the $30 package, slept through most the flight, and really didn’t think I’d end up a thousand bucks past the limit.